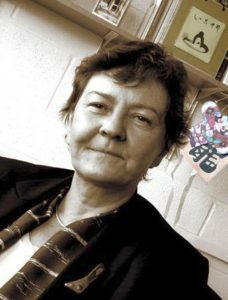 Barbara Jikai Gabrys, PhD studied Rinzai Zen with several Zen masters for many years. Kyudo Nakagawa Rōshi and Eizan Goto Rōshi had provided foundations of her Zen practice. She has finalised her Zen training with and received the Dharma transmission from Shinzan Miyamae Rōshi in the Hakuin-Inzan line of the Rinzai tradition in November 2016. She continues to deepen her Zen practice under a mentorship of Melody Eshin Cornell Rōshi. Barbara is a peripatetic European physicist, currently affiliated as Academic Visitor at the University of Oxford. Her work in science has taken her all over the world. Her experience of international research centres has made her aware of the need to bridge the gap between different cultures, and especially the Eastern and Western way of life. She believes that cultivation of well-being, with double focus on concentration and openess will lead to the recognition of true interconnectivity between all sentient beings. To this end she combines various philosophical and practical Zen approaches in her teaching. Zen teacher (junior level) Richard Gensho Shindo Jones has been a Buddhist since 1983. He is practising Zen from 1985, being originally a student of Daido (Yamahata) Hogen Rōshi , Abbot of Chogen-ji Temple, Japan and founder of the Open Way Association, Australia and Spain. He later studied with Daisetsu (Harada) Tangen Harada Rōshi, Soto Abbot of Bukkoku-ji Zen Temple, Obama-shi, Japan. Gensho has practised Iyengar Yoga since 1973, and combines it with other types of yoga and Tai Chi exercises. He took Jukai precepts with Hogen Rōshi in March 1998, became a monk, under Tangen Rōshi at Bukkoku-ji in January 2009, and a junior Rinzai Zen-teacher under the direction of Jikai (Barbara Gabrys) Roshi, on the 07/12/17. Gensho studies under the direction of Jikai Rōshi in the Hakuin-Inzan line of Rinzai following teachings of Shinzan Miyamae Rōshi, and leads the Sheffield ZenSpace http://www.arrivinghome.co.uk/.